It can be overwhelming to keep up with all the meetings and presentations regarding environmental issues in Butte. Last week alone, there was a TAG group meeting, a Health Monitoring working group meeting, and a public scoping meeting for the Yankee Doodle permit amendment. One of the goals of these environmental news segments is to keep you abreast of the happenings at these meetings, so I’ll take the next few minutes to give you some of the highlights from this last week. TAG groups are a part of Superfund, TAG stands for Technical Assistance Grants. These are grants from the EPA given to citizen groups associated with Superfund sites. These volunteer groups use this funding to contract with technical experts who can help the public understand and engage with the remediation process. Our local TAG is called Citizen’s Technical Environmental Committee. The board is comprised of a mix of engineers, scientists, and communications experts, and full disclosure, I myself am a board member. They hold monthly meetings that are open to the public and cover a wide range of issues. Frequently, local officials and representatives of various stake holders present to the board and the public. It can be a great way to stay informed of current events, but it can also be pretty boring. This last Tuesday CTEC held a meeting at the Butte archives with a full agenda. I thought I’d give you, the listener, a taste of the content of these meetings with a brief summary of each topic. There was a presentation from Josh Bryson, from ARCO. 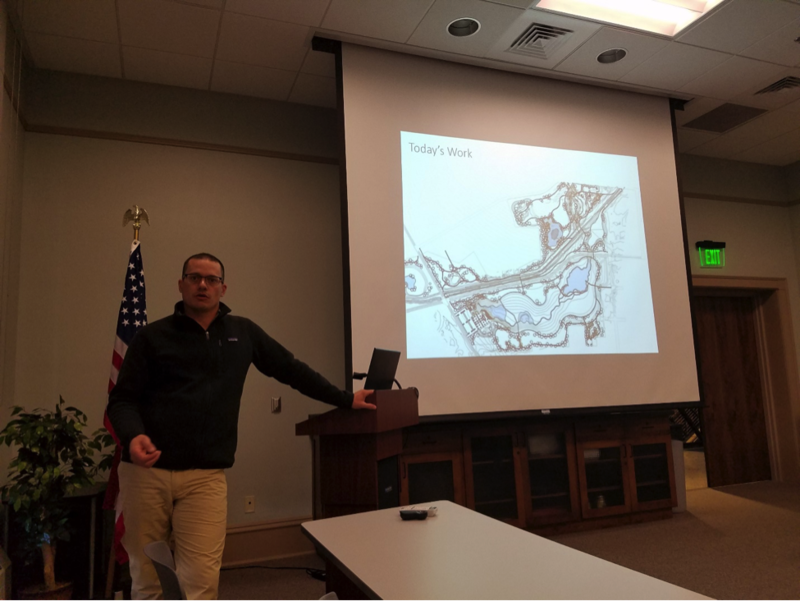 He was giving an update on the end of use planning for upper Silver Bow Creek, following a series of public meetings soliciting design input. Josh faced questions from folks concerned about the lack of a creek and the large size of the stormwater retention basins. He conceded they are faced with many design challenges. He unveiled several new design elements in the Northside tailings and diggin’s East, including a fishing pond and a series of stormwater basins with a circular pumping system keeping it full and flowing. Expect to hear much more about this once stakeholders have had a chance to digest these new proposed plans. There was an update on a National Institute of Health funded research project, conducted by folks at Montana Tech and CTEC board members. Stay tuned next week for more information on this health study. The main feature of the meeting was an update on the Pole Plant from the DEQ and a presentation on a potential treatment alternative. The Pole Plant is Butte’s smaller Superfund site, it was a wood treatment facility that was contaminated with diesel, pentachlorophenol, and dioxins. The treatment strategy of the past decade has proved insufficient, and the DEQ is about to release their proposed changes to the plan. I asked Allie Archer from the DEQ why they were using an “Explanation of Significant Difference”, or ESD, when they were making a fundamental change to the Record of Decision. So we’ll wait to hear more from the DEQ. Next, mycologist Cliff Bradley presented his research into a potential fungal bioremediation process that could be implemented at the Pole Plant. Cliff explored this idea years ago at the site but at the time the target was Pentachlorophenol, not the dioxin they are after now. CTEC asked him to prepare a proposal on an alternative to capping. He laid out a plan for how he would tackle this. But the DEQ seemed as though they weren’t interested. They were looking for CTEC to support a letter asking the regulatory agencies to include the neighborhood in future remediation and planning. And this is the mission of CTEC, to help facilitate communication between the residents and the regulatory agencies. The board was able to make some suggestions as to where they could address their concerns, and I will report back on their efforts in future stories. Thursday evening there was a DEQ meeting at the Copper King convention center. The DEQ held the meeting to share some information and to solicit public comments. The permit would allow Montana Resources to expand their tailings impoundment, allowing another 12 years of operation. Though they stated they were only looking for comments on the substance of the plan, most commenters were simply there to support of the project. Citizens and public officials lines up to praise MR and to voice their approval of the project. A few commenters had specific concerns, of the dust and of seismic vulnerability, but the majority of the crowd was clearly there to be sure the project just moves forward. There is still plenty of time to submit comments directly to the DEQ, and comments of substance will help shape the environmental impact statement. So that wraps up the meetings for last week, and there will be many more in the weeks to come. If you’d like to get involved, or just stay informed, show up to one of the many meetings, or stay tuned, we’ll be there.